The Revolutionary War workshop is intended to introduce students to the realities of 18th century warfare as experienced by the Continental soldier in New England at the outbreak of the war. Using the Battle for New England as the historical back drop, they will learn from maps and projected images what the British and American strategy was in the opening year of the war. 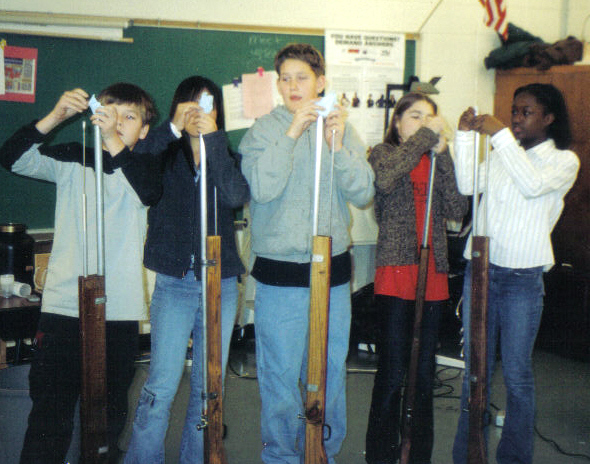 Students will handle period firearms and weaponry, as well as period uniforms and artifacts. They will make cartridges from scratch which will be used in a mock battle with a 'regiment of British Royals'. Armed with muzzle loading faux rifles our minutemen/women will have to load their muskets, ramming the balls home in a timed 'order of loading' while under the press of time and the advancing enemy, all while feeling the pangs of battle, listening to loud tapes of battle scenes, seeing the billowing smoke from cannon and rifle fire, hearing the screams of wounded and frightened peers, and being pressed by their commander to stand their ground and hold back the invaders. This is a 'full involvement' program where everybody has a job to do.